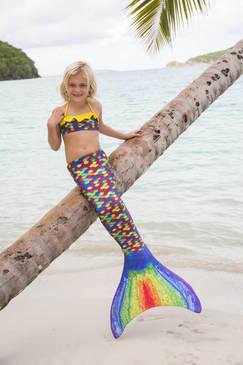 Spindlebeak will provide you with a Fin Fun mermaid fin and tail, during the class. We want you to know that safety is our top priority. Fin Fun tails and monofins meet the Consumer Product Safety Commission (CPSC) requirements for the United States and are constructed using top quality materials. A Fin Fun mermaid tail has an opening on the bottom of the monofin and the tail to avoid trapping air that could form air pockets. Also, our foot retainers are specially designed to quickly release from feet with a slight tug to remove one foot, and then a quick push and kick to remove the other, yet it will remain snuggly on the feet during swimming. The soft, durable neoprene covering is also extremely comfortable and lightweight. The Fin Fun monofin has a unique natural motion that looks like a real fin when swimming to create the illusion of an actual mermaid fluke! Made from high quality neoprene with an indestructible polypropylene insert, it is rigid enough to provide strong propulsion, but with flex to look like a real fin. And the carefully designed cuffs and foot pocket help hide feet and ankles. The buoyancy of the neoprene cover compensates for the weight of the monofin, making it feel light in the water and allowing you to swim longer with less effort. You have to feel it to believe it. Other monofins can hurt, pinch, or rub the feet and ankle. The soft cuffs and neoprene are a pleasure to wear and easy to get on/off. Not only does the monofin create a realistic mermaid look, the patented design propels you through the water quickly and efficiently, allowing you to swim up to two times as fast with less exertion! Watch a demonstration here. Mermaid swimming is not just fun, it also provides great exercise! Helping you build muscles as you swim, the monofins are so comfortable to wear you can keep them on longer and strengthen your core muscle while you play. THERE’S MAGIC INSIDE YOUR MONOFIN! 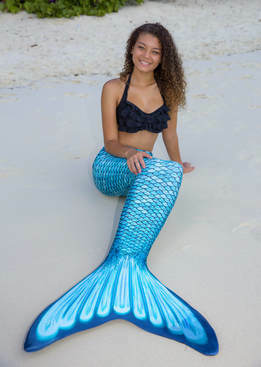 Our uniquely designed monofin was created to give your Fin Fun mermaid tail the most realistic look and movement possible. Shaped like a mermaid fin and covered in high performance neoprene, the custom molded insert is what makes the monofin hold its mermaid shape while providing the awesome propulsion experience of a fin. 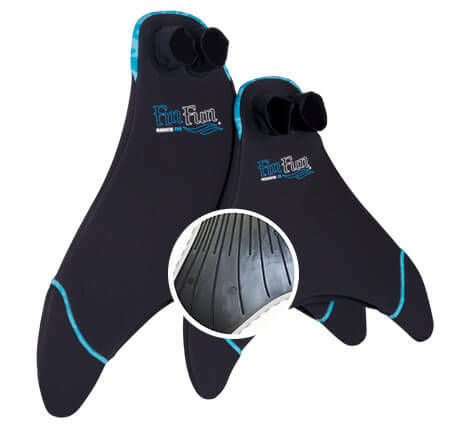 The Fin Fun Monofin insert is made from a highly advanced polypropylene material blended with recycled plastics, which provides strength and rigidity while remaining extremely light and flexible. Using recycled materials also helps to reduce the plastic floating around our oceans! Our premium monofin insert is extremely durable, but if it ever should break, Fin Fun offers a lifetime warranty on the insert so you can get a new one free!